If you have pain and stiffness in your lower back and hips that comes and goes, you may have something called ankylosing spondylitis. Let's talk today about this condition. Ankylosing spondylitis is a long-term disease that causes inflammation of the joints between your spinal bones, as well as the joints between your spine and pelvis. We don't really know what causes it, but we think that genes play a role. We do know the disease mostly affects men, usually beginning between ages 20 and 40. It also seems to run in families. Eventually, the disease can cause spinal bones to join together, causing people to lose the ability to move their lower spine. If you have ankylosing spondylitis, you may have pain and stiffness at night, in the morning, or when you're not active. The pain may begin in the joints between your pelvis and spine and then move along your spine. Your pain may get better with movement or exercise. 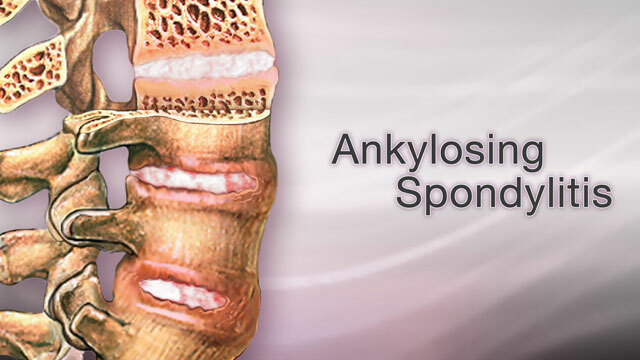 So, what can you do about ankylosing spondylitis? Well, your doctor will probably want you to have a number of blood and imaging tests to confirm the diagnosis. For pain, the doctor may prescribe nonsteroidal anti-inflammatory drugs (NSAIDs) like ibuprofen. You may need to take medicines such as prednisone or other medicines to suppress your immune system. Another medicine, called a TNF-inhibitor, can block an inflammatory protein in your body and greatly improve the symptoms of ankylosing spondylitis. Ask your doctor about exercises that can help improve your posture. Lying flat on your back at night can also help your posture. Eventually, if your pain or joint damage is bad enough, you may need surgery. The course of this disease is different for everyone. For some people, symptoms may come and go at any time. The good news is that most people can function and lead a productive life unless the disease is very bad in their hips.